It’s always exciting to discover a book with so much to offer. 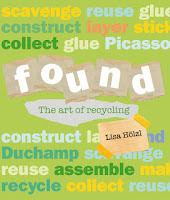 In Found: The Art of Recycling, Lisa Holzl addresses sustainable art - but not only in an original way. It’s aimed at varying age groups starting with children, whom she encourages to create new things from old, used, or everyday materials that are around us everywhere. There are fine examples of many artists - some Australian, of the way these found objects and discarded materials were utilized in their artistic creations. There is some history of art: Modernism and Postmodernism. It covers all the changing trends from 1907 and Cubism, and has a Timeline which follows the different styles up to today’s Contemporary art. The artists include Pablo Picasso, Carlo Carra, Marcel Duchamp, Dada artist Raoul Hassmann. There is Joseph Cornell and his boxes, Robert Rauschenberg who used freestanding furniture as part of his artwork, and Fiona Hall, who was inspired by her historical research into the travels of the famous Joseph Banks. Indigenous artist Adam Hill and his work –The Crate Land Grab is included along with many others. This is a clear and carefully considered book, and made from 100% recycled paper. There are Activity suggestion boxes for children to create their own artwork. It displays ways that life can be enriched by reusing and recycling discarded objects; making the old new, and realizing that you are limited only by your imagination when making art. While it is centrally about recycling, it also contains a great deal of interesting and thought-provoking information. Beautifully produced, the cleverly designed cover speaks volumes. The background is environmental green. It is covered on the back and front and on both end pages, with countless words associated with recycling, found goods and creating/making art. For the readers’ information, it contains a double page of Artist Biographies, a Glossary of artistic terms, an Index, and a rich Bibliography. There is also a listing of Artwork Credits and Picture Credits. This book is educational as well as a creative life tool for children and adults.